Room by Interior Designer Denise McGaha. Painting by David Crimson at Craighead Green Gallery. Fun, fast, and fabulous . . . Dallas designer Denise McGaha specializes in working on the kind of short turnaround that would make most people's heads spin. For instance, the design and installation for the 2011 Texas State Fair Home of Tomorrow, which she created with Regenesis Design Build, took her 16 days. 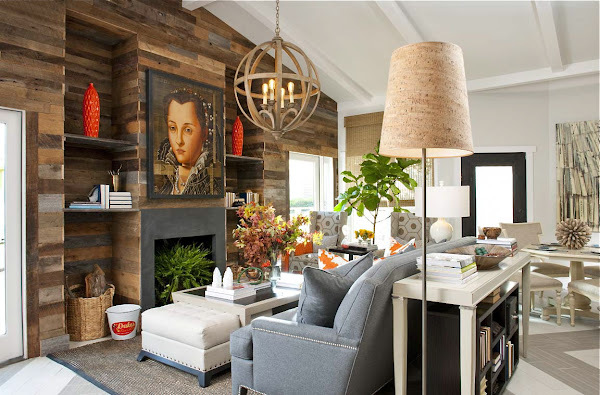 Room by Interior Designer Denise McGaha. Photo by Dan Piassick. After 11 years in the business -- most of them as a design consultant for area contractors, architects, and builders -- she's launched a concept based on her ability to get things done, fast. "Design with a Deadline" offers a 90-day timeline for design selections for remodels, new construction, and interior design projects. "We've created a product for the person with a short timeline, whether it's a party, event, construction, or remodel," she says. "We work with the contractors or others involved to get it done within your deadline." Pricing for the service is calculated per square foot. Denise McGaha photo by Dan Piassick. McGaha's timeline includes setting milestones for the project and regular meetings, where she helps you select everything you need to get the project finished. Furnishings and finishes are drawn from a preselected menu of high-end resources that McGaha has spent years cultivating and refining. "We've got some great relationships and partnerships with manufacturers who can turn things around on a tight deadline, " including Hickory Chair, which produces custom pieces in about three weeks, she says. Details by Denise McGaha. Photos by Dan Piassick. 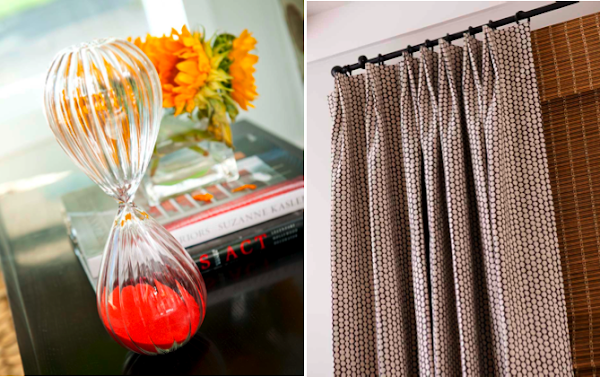 "Designed in a Day" is McGaha's answer to clients who need the expertise of an interior designer for a single room or a small project, and costs about $1,500 for four hours that include consultation, shopping trip, and a written plan for achieving your goals. "It's for people who read design blogs till they're blue in the face, but don't have access to the showrooms," she says. "They're savvy, but they still need help with scale and proportion in a room, or they need help choosing the size right rug or draperies." A collection of vintage bonsai sheers makes for an unexpected wall display. Vignette by Denise McGaha. Photo by Dan Piassick. McGaha, who grew up in a small ranching community in Central Texas has a background in economics and was a part of the team who launched NeimanMarcus.com years ago. Interior design has always been a serious hobby, but it didn't turn into a career until she built her own home and saw how the process of choosing finishes and fixtures were often at odds with the builder's schedule, creating expensive delays. McGaha customized her own checklists in an effort to expedite and streamline the building process, and showed them to her builder. "I told him his process was broken and that I thought I could help," recalls McGaha, who was ultimately hired as a consultant by the builder. In 2001 she hung out her own shingle, specializing in million dollar-plus homes. She now works regularly with top builders and contractors like Phillip Jennings Custom Homes, Waterford Construction, Kensington Estates, and Dallas Renovation Group. Currently, she's working on three homes in the Park Cities, one in Southlake, and two in Plano. "My experience and knowledge of construction makes me able to explain the process to clients," she says. "I work on a timeline and the builders love me for that. Clients love how it saves them money and time." Kitchen by Denise McGaha. Photo by Dan Piassick. As a designer, McGaha focuses on the mix. 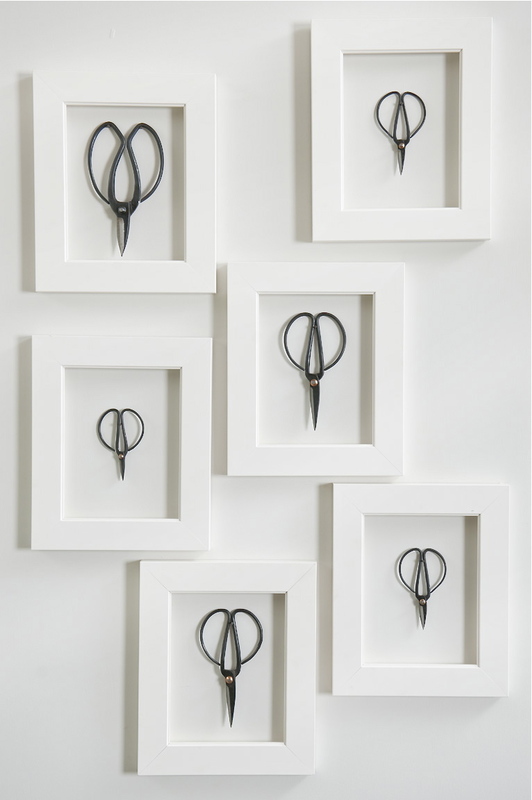 "My style is about layering a room with different pieces and great art. I like there to be at least one antique in every room, and I love collections and tablescapes. Often clients will hire me to create just a tablescape or collection for them," she says. Kitchen details by Denise McGaha. "I'm all about pops of color," says McGaha. 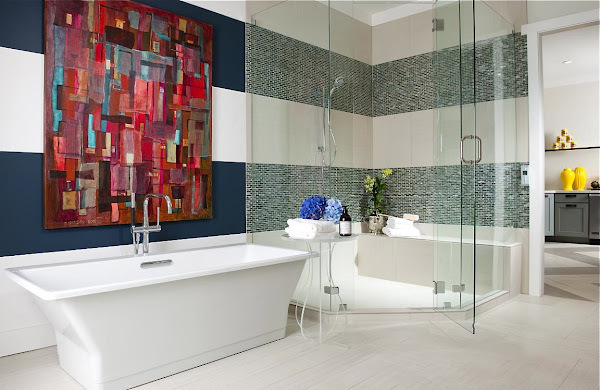 "I take a color and repeat it in different textures and materials throughout a room. My style is unique and fresh, I think, but it's also bold -- it goes with my big personality!" 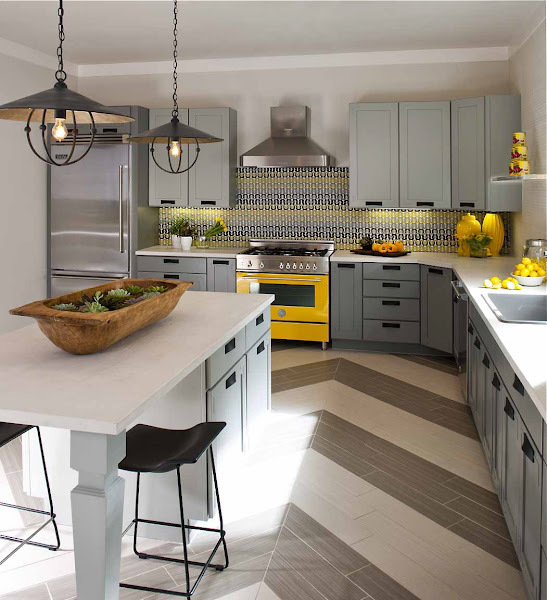 The yellow and gray backsplash for the showhouse kitchen (shown above) is an outdoor fabric by Trina Turk, which she has covered with removable glass panels, so that the fabric can be changed out. The fabric was the jumping off point for the rest of the kitchen, including an Italy-made Ferrari-yellow Bertazzoni oven. The cabinets are painted gray, with painted galvanized steel corners for texture, and black leather hardware drawer pulls. 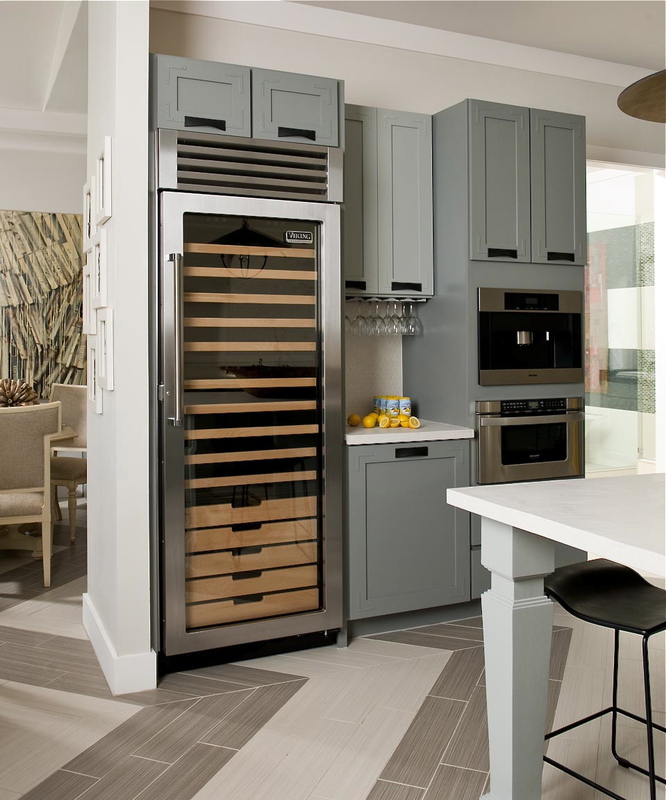 The striking chevron-patterned kitchen floor was custom designed by McGaha in taupe and cream porcelain tile fro Daltile. The lighting in the kitchen and throughout the house is courtesy Currey & Company. Artwork by Pamela Nelson of Craighead Green Gallery. To make the showhouse master bath appear larger, McGaha painted the walls with navy and white nautical stripes, then extended the idea to the shower with tiles. Flooring and wall tiles are from Daltile. The tub, sink, and fixtures are all from Kohler. An acrylic table from Hickory Chair provides a useful surface without taking up visual space. Master bath details by Denise McGaha. Photo by Dan Piassick. 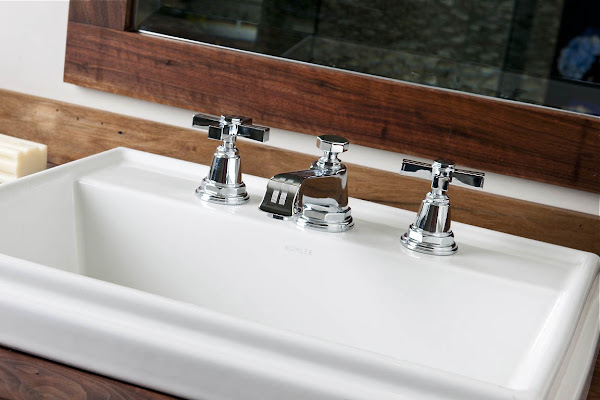 Reclaimed black walnut, which as been oiled for water resistance, is a warm contrast to all the porcelain and tile in the bath. "It's warm without looking like a lake house," says McGaha. 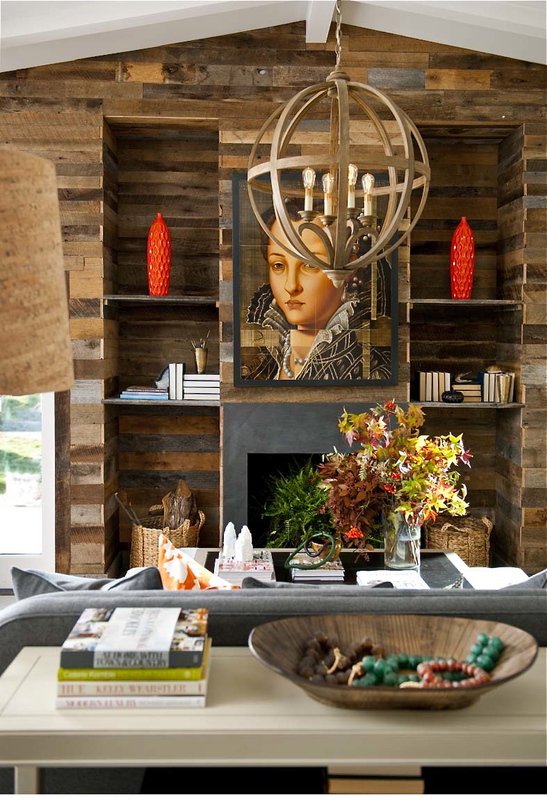 Beautiful wood and the mix of materials are what make it work, she adds. 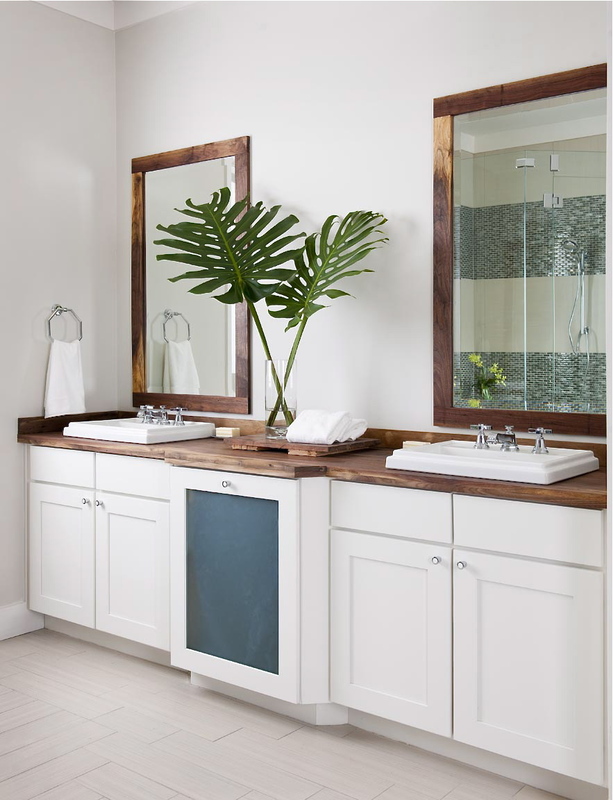 Master bath details by Denise McGaha. 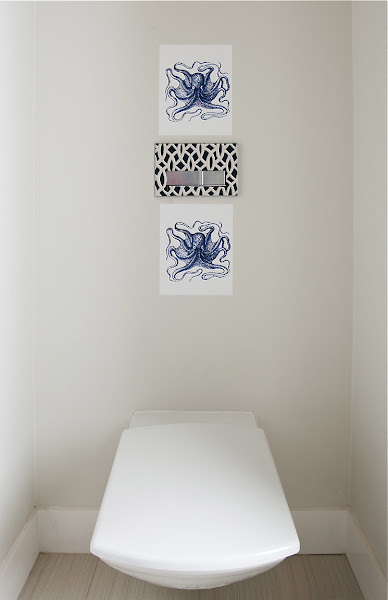 A floating Geberit toilet has a tank that's receded into the wall for ultimate minimalism. 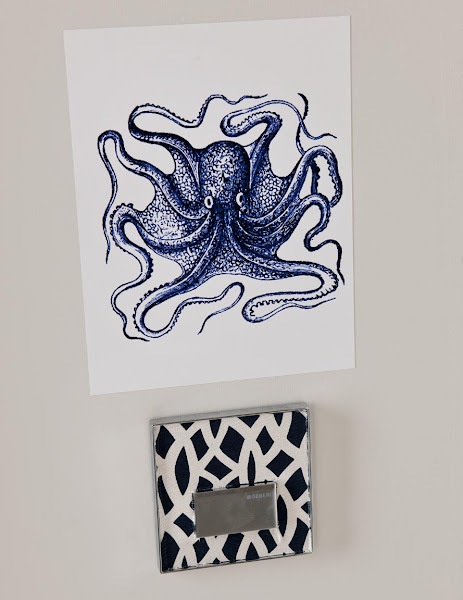 The two-button flush mounts on the walls with a self-adhesive plate that accommodates fabric and wall coverings, such as this trellis pattern from Schumacher. The octopus art provide a little whimsy in an unexpected place. 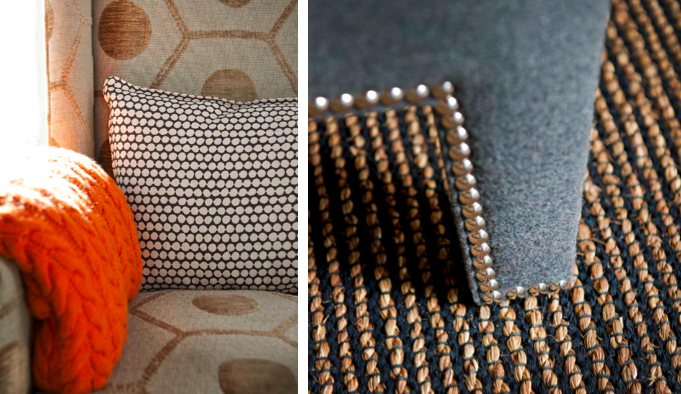 "Showhouses really do help clients visualize how a designer thinks," says McGaha. "I'm all about styling a space. If a client is concerned about designing for resale, then we'll do a neutral backdrop and colorful art and pillows that can go with you when you move. Otherwise, I'll try some risky ideas, like the yellow oven, and say, 'Let's have fun!'". NOTE: McGaha is working on a downloadable workbook that walks clients through the process of building, renovating, and designing a home, room by room. She's hoping to have it available on her website by early summer. The cost will be nominal, about $15. Her blog has some terrific information-packed posts on how to make paint selections quickly, navigating the slab yards for selecting granite and marble, how to make plumbing choices, mixing metal finishes, and what to do when your designer asks you to reselect fabric once you've already made your choices. It's meaty stuff, and all worth taking notes if you're thinking about building, renovating, or redecorating.